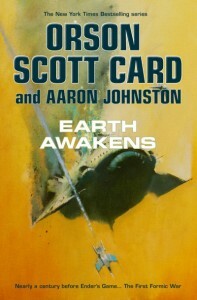 ‘Earth Awakens’ by Orson Scott Card and Aaron Johnston is the third novel in the First Formic War Trilogy and the sequel to the New York Times best-selling novels ‘Earth Unaware’ and ‘Earth Afire’. This prequel to ‘Ender’s Game’ tells the story of the first formic invasion 100 years before ‘Ender’s Game’. ‘Earth Awakens’ is the satisfying answer to the cliffhanger left by ‘Earth Afire’. The combat scenes are thrilling, the dialogue is sharp, and the characters are every bit as rich as they were left on the pages of ‘Earth Afire’. Favorites such as Mazer Rackham, Bingwen, Victor Delgado, and Imala Bootstamp all return to save humanity from the first formic invasion. Like its prequels, ‘Earth Awakens’ is told from several perspectives. In the first two novels this feature helped world build, but in ‘Earth Awakens’ it creates perfect suspense. The first half of the novel is almost pure action. While this would be satisfying to someone who’s just completed ‘Earth Afire’, those who haven’t picked up ‘Earth Afire’ in a year will find the extended combat scenes to be somewhat tedious. In an action-packed novel, it’s easy to paint characters with generic passion. Thankfully, the characters in ‘Earth Awakens’ reflect the many attitudes toward war. There are characters who fear, act heroically, act indifferent, and some characters who use war as financial opportunity. This subtle attention to detail creates a believable future for readers that I greatly enjoyed reading. The second half of the novel reintroduces readers to Bingwen, the Chinese child genius. Readers will continue to fall in love with Bingwen as his plotline leads him to an unsurprising and familiar future. Although I wished Bingwen had more scenes in ‘Earth Awakens’, I’m almost certain that readers will see much more of him in the Second Formic War Trilogy. All in all, there are fewer surprises in ‘Earth Awakens’ than the first two novels in this trilogy. The novel rightly focuses on detailed conclusions rather than the introduction of new twists and turns. If you’ve read ‘Formic War: Silent Strike’ than you can consider ‘Earth Awakens’ to be an extended edition of the graphic novel. The close of the war, the budding romances, and the development of key entities important in later novels reach satisfying conclusions in ‘Earth Awakens’. Apart from Mazer Rackham, there are few concrete details in the first two First Formic War Trilogy novels which tie the series to the rest of the Enderverse. However, ‘Earth Awakens’ differs from the first two novels in this respect. ‘Earth Awakens’ ties this trilogy into the rest of the Enderverse in a beautiful and intricate way. The novel pulls elements from, ‘Ender’s Game’, ‘The Gold Bug’, ‘Shadows in Flight’, and ‘The First Formic War: Silent Strike’. Card and Johnston have accomplished what few science fiction authors have not. In an increasingly expanded science fiction universe the material further unifies the series instead of contradicting elements. As a member of several fandoms, I appreciate the thought and care that went into the construction of this novel. ‘Earth Awakens’ is the well-deserved conclusions for patient fans who read the first two novels in the trilogy. Readers do not need to have read ‘Ender’s Game’ to understand the First Formic War Trilogy. One can begin the story with either ‘Earth Unaware’ or ‘Earth Afire’, but ‘Earth Awakens’ is too fast-paced to bother with much backstory. I recommend reading at least ‘Earth Afire’ before opening ‘Earth Awakens’. I really enjoyed reading ‘Earth Awakens, and I know I’ll reread this trilogy again. I have no real criticisms and I would recommended ‘Earth Awakens’ to all science fiction readers and fans of the Enderverse. After reading the epilogue I’m excited for the release of the Second Formic War Trilogy. ‘Earth Awakens’ will be released tomorrow, June 10. Pick it up at your local bookstore or pre-order ‘Earth Awakens’ on Amazon.